Cape Fear Coastline, Carolina Beach is a favorite destination for East Coast surfers. This beach town features a wide range of beaches to choose from, as well as traditionally gentler waves in the summer months that are great for beginners. As a result, visitors who’ve always dreamed about the surfing lifestyle – or who just wanted to see what all the fuss is about – will feel right at home at this vacation destination where daily life revolves around the beach. Newcomers will likely want to head to the local lifeguarded beaches, (there are roughly 20 lifeguard stands in a three-mile long stretch of shoreline in the summer season), to ensure safety and to enjoy smaller waves that are perfect for beginners. Lifeguards are available from Memorial Day until Labor Day, and generally from roughly 10 a.m. until 5 p.m. or so, depending on the spot. More experienced surfers who want a little more of a challenge – even if the overall terrain is flat in the Carolina Beach waters – will want to go to the beaches close to the Carolina Beach Fishing Pier, which have become a hotbed for visiting and local surfing vacationers alike. 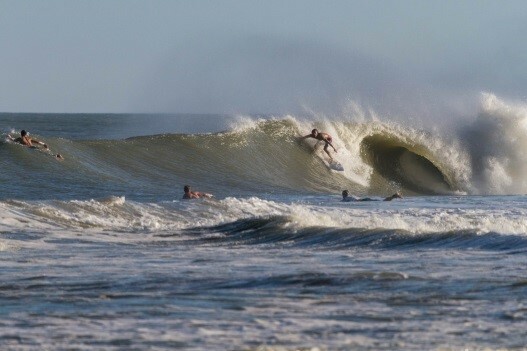 Regardless of where you go, Carolina Beach’s waves are generally optimal for longboard fans and surfing newcomers, although the area can experience a nice swell when a seasonal hurricane or nor’easter passes miles offshore. Expect leisurely rides throughout the year and a little bit of competition for the good waves. Surfing is popular in this region of NC, and many Wilmington residents and inlanders will make a trek to the beach for the day if the waves are exceptional. Carolina Beach is a fantastic destination for beginning surfers, thanks to a shallow and gently sloping ocean floor, generally small waves in the summer months, and ample wide beaches for preparation. As such, it should come as no surprise that there are a number of local surfing schools and instruction options available for people who want to learn. One of the most popular local schools, the Tony Silvagni Surf School, has one of the best teacher-to-student ratios in the area, (with an average of “one teacher for every two students”), and as such, offers a wide range of classes that can range from adults who want to hone their skills, to kids who want to try a new adventure. Additional options, like Odysea Surf and Kiteboard School, or a number of private instructors that can often be contacted through local surf shops, are also available, making it easy to take a willingness to learn to the next level. Instruction can range from 1-2 hours on the beach to full-day camps where all the fundamentals are covered (and then some). 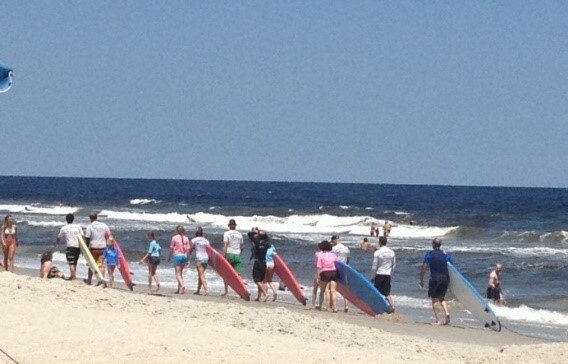 Surf lessons and camps are prevalent throughout the summer season, Memorial Day through Labor Day, and additional shoulder season options may be available as well – specifically in the spring and fall months – when swells can be bigger and more challenging. Most all equipment is accounted for at a surf lesson or camp, although surfers will want to bring along plenty of sunscreen for the adventure. There are a number of surfboard and equipment rental providers, as well as surf shops, which are dotted throughout Carolina Beach, and especially along its “main drag” of Business,US 421. Local surf shops offer new boards for sale, as well as a suite of accessories that can make a surfing adventure easier despite the weather conditions, such as full wet suits or spring suits, surf wax, sunglasses, flip flops, and other must haves. In addition, visitors who just want to invoke the surf vibe will find a number of name-brand apparel and accessories such as Rusty, Quicksilver / Roxy, Reef, and more, which are all famed companies that specialize in apparel, footwear, and accessories that are perfect for life at the beach. As for rentals, a number of local establishments, like Pleasure Island Rentals, offer a host of beach gear supplies which can include surfboards and extras like wet suits. Surf board rentals can be available for a few hours, a day, or even a full week, and can be ordered in advance online for extra convenience. There are a number of surfing events which periodically land on Carolina Beach, and which have the potential to attract the “best of the best” surfers from all across the East Coast. The Eastern Surfing Association, (or ESA), is dedicated to the sport of amateur surfing and has been attracting surfers from all over the Eastern Seaboard since it was first established in 1967. The organization hosts a number of events in the Carolina Beach region, which includes a HotWax Challenge in March, a 17th Street Shred Fest in August, and a Wahine Classic in the late summer / early fall. In addition, it’s not unusual for special events – which can include regional competitions – to be held in the Carolina Beach area if the conditions are right. For a full schedule of upcoming ESA events, visit http://esa-snc.com/calendar/. In addition, Carolina Beach is home to a new event that’s already gaining steam, the Carolina Beach Longboard Club Surf Contest. Held in the spring, and featuring a Guppies Division, an Amateur Division(s) and a Professional Division with a hefty Men’s Pro Longboard Cash Purse, this surfing tournament is poised to put a spotlight on local Cape Fear surfing at its best. Regardless of a visitor’s surfing pursuits, the sheer number of tournaments that arrive on the Carolina Beach shores make it an enticing destination for visitors who want to join in, or just take a back seat and watch the action. Best of all, with steadily warm waters throughout the year, virtually any visit can be a great time to catch a surf tournament or two on Carolina Beach. Surfing has always been hot on Carolina Beach, and with such a laid back atmosphere, as well as steady summer waves that are ideal for newcomers, it’s easy for new visitors to join in the fun.